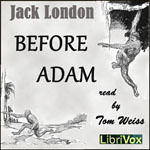 Before Adam is a mixture of sound science and sci-fi speculation. It is based around Darwin’s theory of evolution and the idea of racial memory. The main character lives in the current world but has dreams and nightmares that he relives the pre-stone age life of one of his proto-human ancestors. Those who are scientifically inclined may enjoy this novel more than fans of “standard” science fiction such as Edgar Rice Burroughs.